The Tank Cartridge, 120mm, Canister, XM1028, is a tank round comprised of 1150 (est.) tungsten balls, which are expelled upon muzzle exit. There is no fuse on this round. While the dispersion pattern increases with range as the velocity of the balls decreases, the dense tungsten balls are used to minimize the velocity fall-off. This program responds to the USFK urgency of need signed by the CINC in Dec '99. RAPT Initiative Funding to be used for 6.0M in FY02 to accelerate development by one year earlier than previously planned. This round meets urgent CINC, USFK requirements to provide effective rapid lethal reaction against massed assaulting infantry armed with hand held anti-tank and automatic weapons at close range (500 meters or less) thereby improving survivability. Additionally, this round will significantly increase the tank's lethality and enhance the tank crew's survivability. This additional capability will give the Abrams Tank the ability to survive RPG ambushes and to fully support friendly infantry assaults. 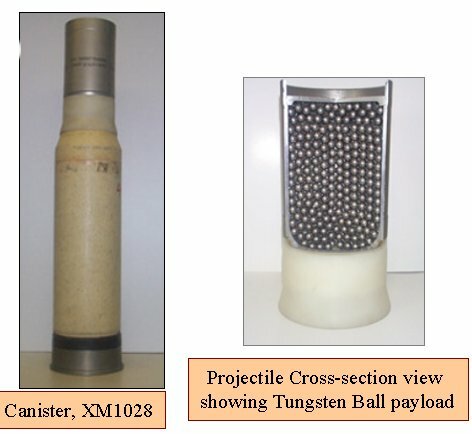 The M1028 Integrated Product Team achieved type classification standard of the canister round on 24 June 2005. The achievement followed closely their urgent release action, with rounds from early lots already headed to where they will do the most good. The earlier significant accomplishment happened in 2004 when the IPT successfully reached its milestone C, Type Classification for Low Rate Production Review, and the recommendation for urgent release to deployed forces by the Materiel Release Acceptance Board. The 120mm M1028 Canister, formerly the XM1028, product and core team were honored as being one of the top 10 Army inventions of 2004. By 07 December 2004, the M1028 documentation and performance had been reviewed by the staff of the Program Executive Officer for Ammunition. Then, the program's executive officer, Brig. Gen. Paul S. Izzo, was briefed by Frank Altamura, the Office of the Project Manager Maneuver Ammunition System's item manager, and key staff. Izzo then signed the milestone decision authority documentation, which granted authority for the program to move forward into low-rate initial production. Shortly after milestone C was approved, two urgent fielding requests were received by OPM-MAS in support of Operation Iraqi Freedom. One request came from the Marine Corps. The second request came from Coalition Forces Land Component Command. The Coalition Forces UFR, approved by the G-3, was processed to respond to a request from the 1st Cavalry Division that was deployed to Iraq. The entire low-rate initial production lot was going to Iraq to support the current conflict. The M1028 is the first 120mm tank round to be fully insensitive-munitions compliant as certified by the Army Insensitive Munitions Board. The M1028 has also demonstrated effectiveness against other targets. The cartridge has been successfully tested against vehicles, structure walls and for obstacle reduction capabilities. Lethality has even been demonstrated on targets behind these structures. The M1028 adds a really powerful tool for tank crews and the troops they support. The Marine Corps had the opportunity to fire a handful of the M1028 rounds during their gunnery training exercise in February 2005 at Camp Lejeune, N.C., in preparation for re-deployment to Iraq. Feedback was that the rounds impressed the tankers as well as a battalion commander from the 2nd Marine Division and the commanding general of the 2nd Marine Division beyond their expectations. While industry was generating the first lots of low-rate production, partners at Fort Knox, Ky. and the ranges sped to develop the training, tactics and procedures needed to quickly field the M1028 to where it's needed. The ammunition support teams have gone into the area of responsibility to investigate what Soldiers need most. Soldiers and their leaders were very excited about being able to add canister to their inventories - the quicker the better.